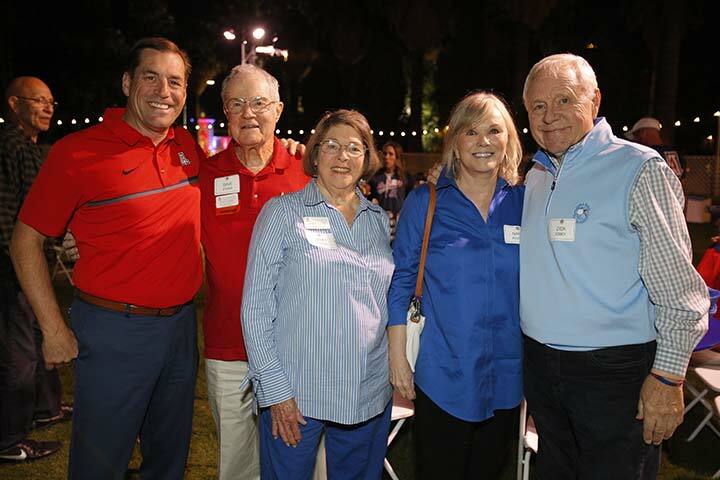 Each year the Wildcat Club hosts a Football Donor Trip where we travel with members from the Golden level and above for an away football game. This year we headed to Pasadena, CA for the matchup against UCLA. On Friday, October 19, Wildcat Club members boarded two chartered planes headed for Los Angeles. After arriving, donors had the option to explore Old Town Pasadena, spend time at Universal Studios/City Walk, or attend a reception hosted by Arizona Athletics at the beautiful Langham Hotel in Pasadena. On Saturday, the group had the morning and early afternoon to themselves before heading to a tailgate hosted by the UA Alumni Association. Both UA President Bobby Robbins and Athletic Director Dave Heeke addressed the crowd and spoke of Rose Bowl aspirations. After the tailgate, the group headed inside the Rose Bowl to watch the Arizona Wildcats take on the UCLA Bruins. Sunday morning it was back to Tucson after an eventful weekend! Thank you to everyone who joined us for this year's trip. To view footage from the trip, click on the video to the right. To learn more about Golden + benefits, click here. 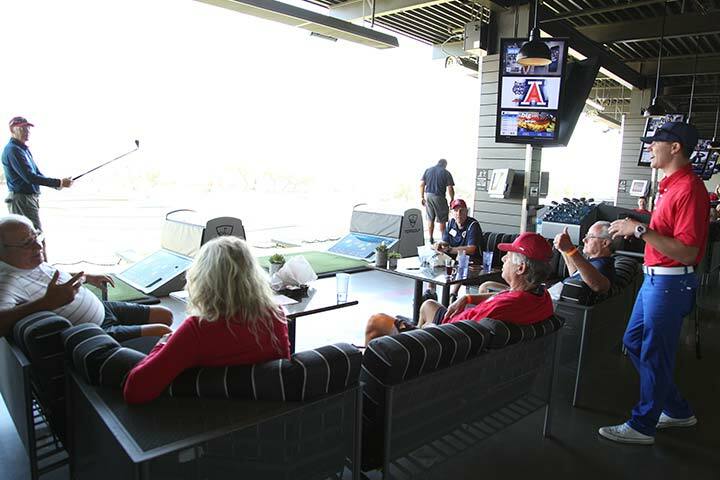 On Thursday, October 18, the Wildcat Club hosted it's first ever Bear Down Bite in Maricopa County! The Bear Down Bite began in fall 2016 and provides Wildcat Club members with a unique opportunity to chow down and catch up with Arizona coaches, student-athletes, and staff. At this particular event, Arizona Men's and Women's Golf hosted a special clinic at the Talking Stick Golf Club in Scottsdale. Check out the video footage from the event! Bear Down Bites occur throughout the year and are exclusive to Wildcat Club members! Keep an eye out for an invitation to the next one tentatively scheduled for spring 2019. As the Director of Baseball Operations, can you tell us how you contribute to the team? Our student-athletes have so many demands coming from within the classroom, on the field, and so on. My job is to take some things off their plate by helping to line up their day, working with CATS Academics, and I also watch film and break down opposing pitchers and hitters for them…that sort of thing. 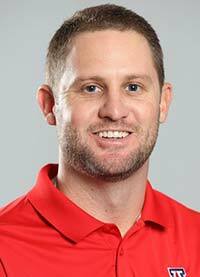 Easy—Coach Johnson and what he's done with this program. And honestly, even before that when I was a player and then a volunteer assistant coach at Arizona State and we competed against Coach Lopez and his teams, I always had a respect for the way Arizona played. We knew we were always in for a competitive game and that we would have to play hard. I was with Grand Canyon University last season and Arizona beat us both times we played them. Afterwards, I sent a text to Coach Johnson and said “Whatever you guys are doing down there is working and that's evident not only throughout Arizona, but throughout the country.” So when he called me up this summer and asked me to join the team, it was a no brainer! You've been here about three months, what's been your favorite experience so far? The Mexican Baseball Fiesta game. We played the Naranjeros de Hermosillo of the Mexican Pacific League. It was so cool to experience another baseball culture because they play differently. The energy surrounding that game was also really fun to experience. What are you looking forward to in your first season at Arizona? Competing in the Pac-12 again. Coach says it all the time, our goal is to go 66-0. I'm excited for the first game and being in the first base dugout rather than the third base dugout, which I've been in many times. What makes baseball so special to you? The competition. It's ultimately a team game, but it's also individual in the sense that it's hitter versus pitcher, and I really enjoy that. I also like showing up to the yard, and this might sound strange, but it has a distinct smell I like. There's also, in my opinion, no better place to play baseball than the state of Arizona. The weather is perfect! If you didn't have a career in baseball, what type of career would you have? Funny you ask...I tell my family all the time that if I wasn't a part of the game, I don't know what I would be doing! I think I'd be a teacher, I like working with kids and helping them develop. What would you like donors and fans to know about you? Baseball is in my blood. My dad played professionally and my grandfather spent 50 years as the president of the Triple-A Pacific Coast League. This game means so much to me. I respect it, I'm passionate about it, and I'm grateful to be here at Arizona. If you're ever out at Hi-C and see me, I love to meet people, so come say hello! You've been a student-athlete, an assistant coach, now a Director of Ops—you've seen baseball from all different perspectives. How important are donors to the success of baseball programs? Extremely important. I've worked for multiple schools, some of which had little funding while others had a lot of support. Donors are a huge piece to the puzzle; they are invaluable. They help provide resources for our athletes, resources that they need. Not only do our impressive facilities help develop our current athletes, but they help with recruiting. Have you heard about the Student Wildcat Club (SWC)? 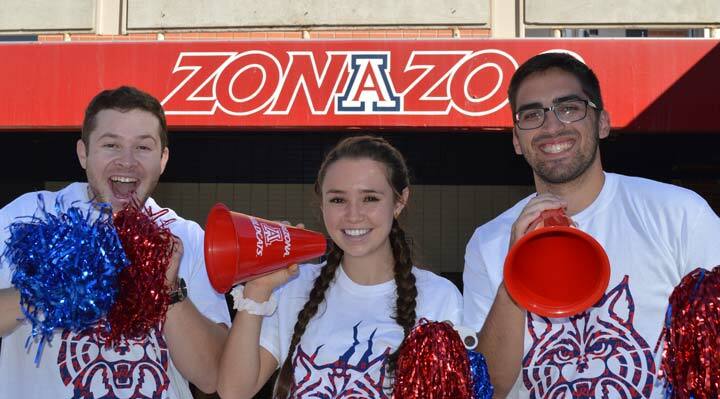 It is comprised of University of Arizona undergraduate and graduate students who support Arizona student-athletes just like you do! We currently have 2,344 SWC members. Benefits include a SWC t-shirt*, access to select events such as Bear Down Bite, 24-hour advanced reservation for Men's Basketball games**, and designated seating in McKale for Men's Basketball games**. Do you have a family member who is a UA college student? Encourage them to become a Student Wildcat Club member! Students can sign up by calling the McKale Ticket Office at (520) 621-CATS or by clicking here. 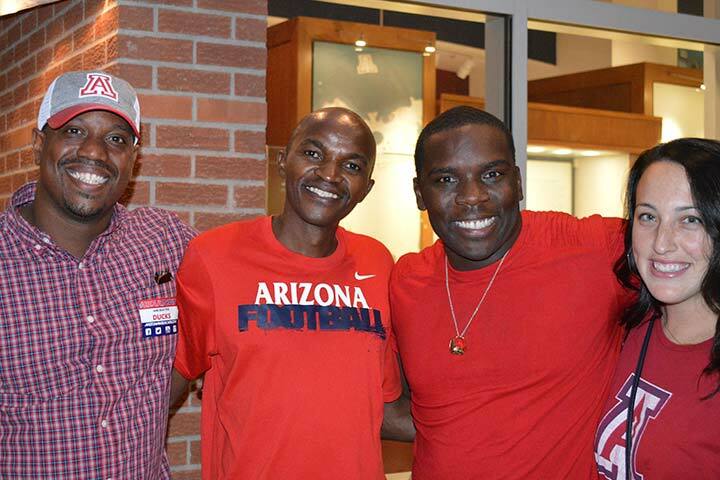 UA Homecoming took place October 26-27, and the weekend was full of fun events for former Arizona student-athletes to partake in, giving them an opportunity to reconnect with former teammates and coaches. 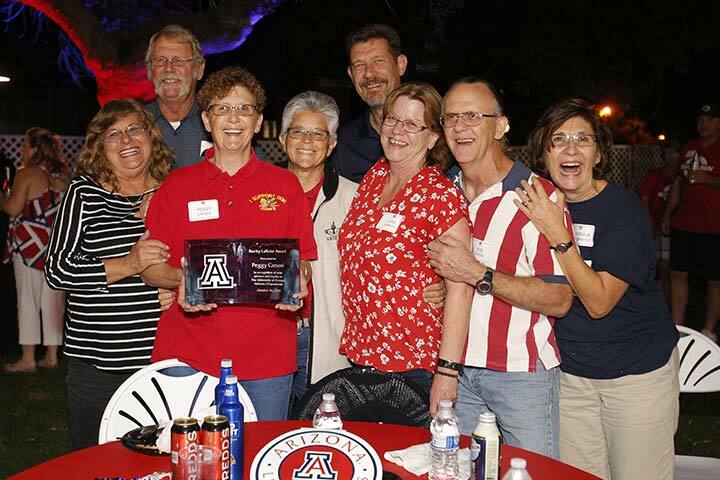 On Friday, Oct. 26, the A-Club hosted an event at TopGolf, which was followed by the Bear Down Block Party located in front of the Arizona State Museum, close to the Homecoming celebrations taking place at Main Gate Square that evening. On Saturday, Oct. 27, all returning student-athletes were invited to attend the Wildcat Club/A-Club Tailgate followed by the Homecoming football game against the Oregon Ducks.